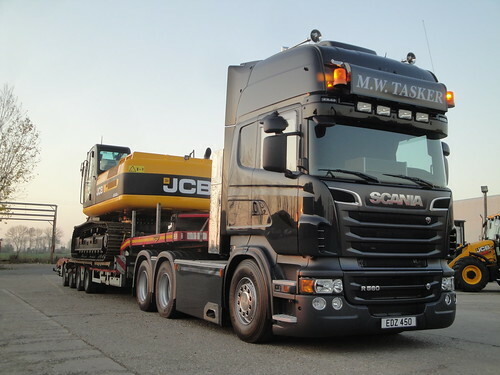 A few weeks back I put some photo’s of MW Taskers new Scania R560 here on the blog. Everyone said how good the truck looks etc etc, but a few of you asked why does a brand new truck, deep in the heart of the Suffolk countryside, have a set of Northern Irish numbers plates, EDZ 450?? and why does the second truck on the Tasker fleet have a similar plate? Keep reading and I will explain all. 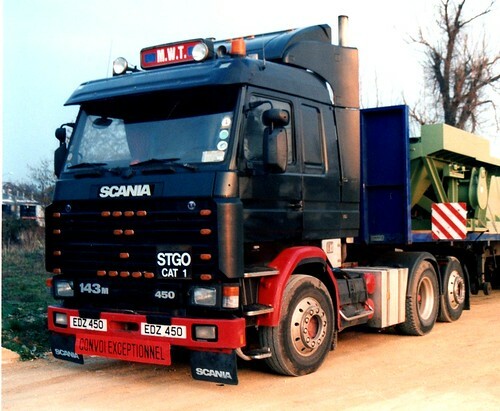 Firstly here is a photo of the original EDZ 450, a real, true legend of the international trucking world!! Back in 1995 a certain Michael Tasker was on the look out for a 2nd hand left hand drive V8 to purchase. 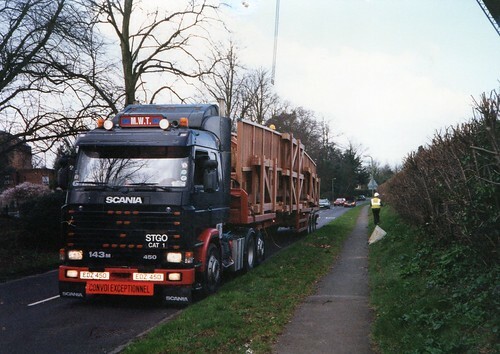 What should he stumble upon, but what appeared to be an ex Ralph Davies Scania 143 450hp. Scania, check. V8, check. LHD, check. Tag axle, check. Ally wheels, exhaust stacks, extra lights, check check check. Perfect. So off to Holyhead to view the truck. Holyhead?? Yes the truck was, at the time, owned by an Owner Driver in Holyhead who went by the name of ED. Are you working it out for your self?? Yes you guessed it, the reg number came from it’s Holyhead owner. EDZ 450 translates to Ed’s 450hp Scania. Thats it. Simple when you know isn’t it?! No real reason for Tasker to have the plate except that it was the reg on the truck when he bought back in ’95 and has kept it on a truck ever since. The simple reason for Tasker’s second truck to have the plate HDZ 450, is purely and simply that is was the closest match to EDZ. So now you know why a Suffolk owner driver has always had a Northern Irish plate. Do you know who owner driver Ed from Holyhead is or was? Then email me, ben@truckblog.co.uk or leave a comment. The next part of the story was a little rumour that Tasker can’t quite remember the details of. The faded memory is that this truck never actually made it on to the Ralph Davies fleet. Is it possible it was fully specced up but the order was cancelled and the truck was sold on. To me, i’m not sure I can quite believe it, but every story has to start from some where. If the truck was finished to Ralph Davies spec, including stacks, lights, wheels, why at that late late stage of new vehicle delivery would it have been cancelled?? No ideas? no me either. Can you help shed any light on the rumour? is there any way of telling if it ever was a Ralph Davies truck? Please feel free to leave your comments or email me, ben@truckblog.co.uk and in return i’ll leave you with a photo of the latest EDZ 450. 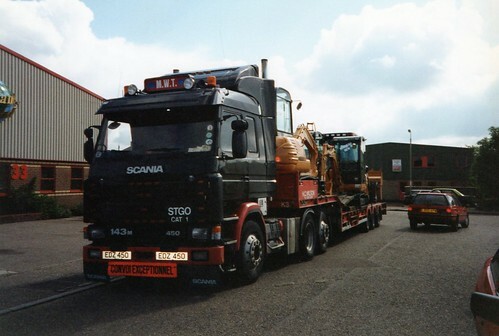 This entry was posted in Drivers Photos, Golden Oldies, International Mega Trucking, Scania, Story Time by truckbloguk. Bookmark the permalink.